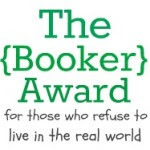 The Booker Award is for bloggers who focus on books. I've been nominated by the fabulous Kayla Curry, author of Obsidian and badass book blogger. Revenge, brooding guys, clever girls, prisons, betrayal, France, pretty old writing--what more could you possibly want? Wilde is my hero. This book is like a painting in prose, with quotable lines every page. What fantasy should be. Whimsy, adventure, romance, and magic, all wrapped up in a clever storyline driven by a strong-willed heroine. A re-telling of Cinderella where no one is what they seem, the cursed girl is the strongest of them all, giants are friendly, finishing school is scarier than ogres, and the princess saves herself--and everyone else. Love love love. I've actually only read this once, but it does everything I want to do as a writer. It's perfect. It's horror, philosophy, and psychology. It makes you love the grotesque. Booker Awards go to . . .
Hey! We both picked The Picture of Dorian Gray for our top 5!